It’s one of the costs of fame IMHO that ‘making it big’ comes with a certain amount of stalking. And with phone-wielding fans watching your every move, it’s certainly become easier to do at scale than when the odd group of girls could find out where The Beatles were staying just so they could scream outside. 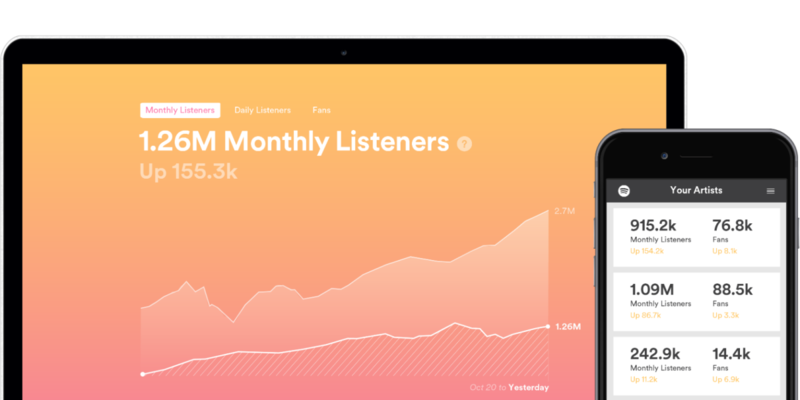 The tables could be about to turn (a bit) with the beta launch of the Spotify Fan Insights dashboard, which gives artists access to aggregated data about their fans’ behaviour. Participating musicians can use the desktop and more basic mobile platform to see demographic and geographical information, listening and music preferences, as well as the level of engagement people have with their tracks. Presumably this could mean marketing messaging for users that might actually be of interest, better gig line ups with other artists you enjoy, or perhaps more shows in your city. Which hopefully won’t mean opening your linen basket to find Harry Styles waiting to take a picture.